TPCS Bidirectional converter system – UL version--Products--China Titans Energy Technology Group Co., Ltd.
Power Conversion System (PCS) is a device to achieve energy bidirectional conversion between the battery system and the power grid (and/or load) with a variety of uses such as with peak and valley adjusting, frequency modulation, phase modulation, emergency backup, etc. It can control the charging and discharging process of the battery and convert AC and DC energy. When power grid is not connected, it can directly supply AC loads. 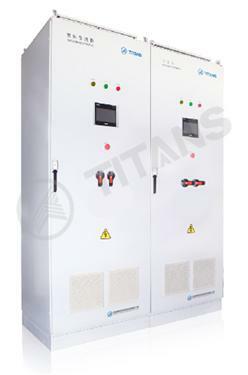 PCS is mainly composed of IGBTs, soft starter, isolation transformer, protection devices, and controller. The PCS controller receives background control instructions via communication and controls the converter according to the sign and value of the power instruction to charge or discharge the battery. The adjustment of the active power and reactive power of the power grid can be realized. Meanwhile, PCS can obtain battery group status information through CAN interface communication with BMS, dry contact transmission, etc., which can protect charging and discharging of the battery and ensure battery operation safety.